Drug Discovery & Pipeline | UBE INDUSTRIES,LTD. Ube Industries (UBE) participated in the drug discovery business in 1983 by establishing the Pharmaceuticals Research group in the R & D Department. UBE's first global R&D project has been conducted in collaboration with Daiichi Sankyo Co., Ltd. and Eli Lilly and Company for antiplatelet agent and has successfully brought EffientTMEfient ®(prasugrel) to market in 2009. Prasgrel has now been approved and launched worldwide over 70 countries by Daiichi Sankyo and Eli Lilly. In Japan, it has been developed also for cerebral vascular disorders, and have ended Phase 3. UBE has researched a novel histamine H1 receptor antagonist in-house and co-developed with Mitsubishi Tanabe Pharma and obtained approval and launched as Talion® (anti-allergy agent) (bepotastine) in 2001. Bepotastine is now expanding its market as ophthalmic and nasal formulations worldwide. UBE has also researched and developed azelnidipine, a calcium channel blocker, in collaboration with Daiichi Sankyo and launched as Calblock® (antihypertensive agent) in 2003. Azelnidipine has further been launched as Rezaltas® in combination with olmesartan, an angiotensin receptor blocker. 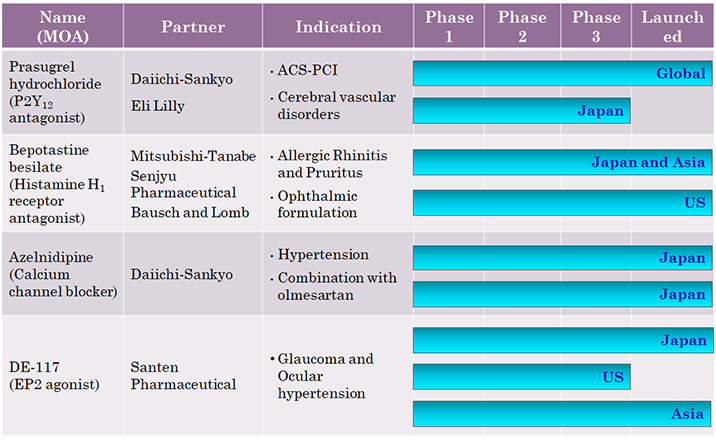 The present new drug pipeline in development is an therapeutic agent for glaucoma and ocular hypertension, DE-117 (EP2 agonist), found by UBE and licensed to Santen pharmaceuticals for co-development. The agent is now under late clinical phase in US. As for preclinical stage agents, multiple projects are now under research in fibrosis areas. UBE's novel drug discovery is carried out either by in-house research or in collaboration with other pharmaceutical companies. In in-house research, UBE is aiming at achieving commercialization through licensing our achievements to major pharmaceutical companies in and outside of Japan. In collaborative research, UBE is pursuing joint development with partner companies, aiming at market approval and commercialization. UBE's research focuses on areas of tissue/organ inflammation & fibrosis, autoimmune diseases & cancers, diseases associated with cardiovascular and metabolic disorders, and respiratory diseases (COPD and asthma). UBE leverages its longtime experience and expertise in medicinal chemistry and pharmacology to full advantage. We work on synthetic small compounds and evaluate them in cell-based phenotype assays and animal disease models to identify candidate compounds for further development. We also work very closely and efficiently with drug metabolism and pharmacokinetics and toxicology to secure a R&D portfolio. UBE proactively changes and continuously challenges in our drug discovery business in order to produce innovative medicine that benefits patients and contributes to the society.